My Cemetery Dance reviews have really taken off. Over on ‘Exhumed’ column, I already done 3 (you can find them here, here, and here), and here on ‘The Bone Pile’, this will be my 5th (the first 4 can be found here, here, here, and here). This time around, I’ve got 2 stories from the newly-released (and hotly anticipated) CD #73/74. Well, 1) Take a look at that cover. Amaze-balls, right? And, 2) It’s friggin’ HUGE. As in, 200-damned pages, huge. 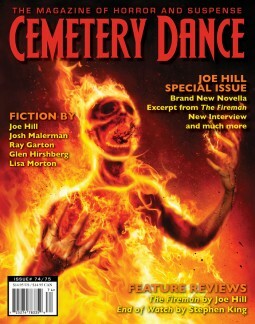 And, 3) It’s a Joe Hill special issue. [SIDE NOTE: Joe Hill = son of Mr. Stephen King… and, oh, by the way, also perhaps the only author who ever turned down publication in Cemetery Dance. Yeah. You read that right. Quick Explanation: He sent in a story a couple years ago. Richard Chizmar read it, loved it, wanted to publish it, but thought the unknown author had an oddly familiar name. He took it to Brian Freeman, his co-editor, & Brian managed to remember and pull from a nearby shelf King’s dedication to his son– Joe Hill King– from the innards of The Shining, a book published no less than 35 years earlier (how’s that for being a fan?) But when Chizmar offered to buy & publish the story then absently asked Hill, ‘By the way, are you Stephen King’s son?’, Hill wrote back, ‘Thanks. Yes I am. But I cannot accept publication.’ You see, Mr. Hill didn’t want to get published b/c of his connection to his famous father. He wanted to earn it on his own. And he did so not that long afterwards. In the meantime, the boys at CD knew who ‘Joe Hill’ really was but couldn’t say anything about it & early fans like me had their respect for Joe skyrocket upon reading Chizmar’s explanation of this situation in the beginning of CD #74/75. So, yeah. They’ve been excited to finally get to publish a guy they rightly felt they had ‘discovered’ but hadn’t been able to showcase to the world… until now]. 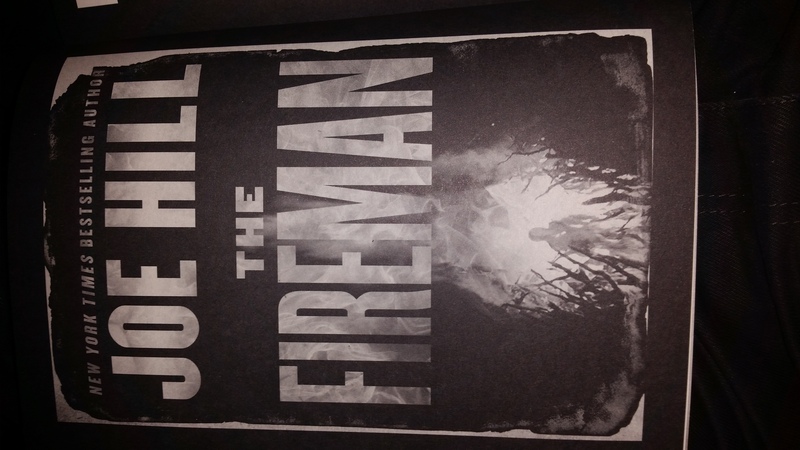 So anyway, this issue has an exposé on who this Joe Hill guy is, two Joe Hill stories (one of which I’ll be reviewing below), an interview with Mr. Hill, and a feature review of Mr. Hill’s newest novel, The Fireman. Joe Hill author blurb provided by CD. FIRST, the situation: An incurable spore called Dragonscale has decimated America. The infected develop delicate black lines on their skin which smolder in times of stress or anxiety. Those who can’t control their fear die horribly of spontaneous combustion. Our protagonist, Nurse Harper Willowes, is infected, is pregnant, and has found the haven of Camp Wyndham where people like leader Carol Storey have learned to suppress and, in ways, control their sickness. But Carol herself is becoming increasingly paranoid, haunted by threats both real and imaginary. She has even come to fear “the fireman”, an outsider to their group who is viewed as a legendary hero because of his ability to control fire. When 2 infected convicts join their group and 1 quickly proves to be dangerous, it isn’t long before Nurse Willowes is summoned in the middle of the night and finds an ‘interview’ is already underway. The secretive meeting includes six people: Camp Wyndham’s leader (Carol Storey), an ex-cop (Ben Patchett), a kid with a big knife (Bowie), another teen guard (Mindy Skilling), our fearless protagonist (Harper), and one of the prisoners (Gilbert Cline). The other escaped felon, Mark Mazzucchelli (or “The Mazz”, according to Gil) is not there. The Mazz is the one already in trouble with Camp & hence the reason why Carol has asked Gil to explain how the two of them escaped from the Brentwood county lockup, a place the prisoners there had called ‘The Furnace’. Gil goes on to tell of a world where Dragonscale has reached a point where fear has taken over the lives of even the good guys. Brentwood was a very small prison, originally designed to hold no more than 40 inmates. When Gil met The Mazz there, a full hundred were already in its walls. Most of the prisoners were there for minor crimes & should have been there only temporary until their trials came… which never happened. Meanwhile the guards had rolled in a TV in the hall and put a pair of kids movies on loop– something which soon drove the prisoner’s mad. They were also underfed and physically punished if they complained. It did not take too long before Dragonscale appeared on one of them. The first guy to come down with it was beaten to death by his fellow inmates. But that didn’t prevent three more men from coming down with it the following day. Soon the guards had all the Dragonscale prisoners herded into a single cell, after which several days passed when everyone seemed to be waiting for something to happen. Then it did. One morning, one of the infected started yelling that he was burning up and literal fire spouted from his throat. He may have died from the fire, or he may have died from the guards’ bullets. All anyone knew was that more than 300 rounds were pumped into that cell and every one of the prisoners was dead a minute later. After that, the other prisoners started getting creative about hiding any newly-formed tell-tale black lines on their skin. The primary method was to mix saliva with the mortar residue that could be scraped from the walls to make a concealing paste. Some of the others ripped their own flesh apart and claimed they’d gotten into a fight during the night. The story finally comes to a head the day most (or all?) of the prisoners are infected yet none are showing. Close to a hundred men still populated the small prison at that time. Knowing some of them were lying but unwilling to get too close to check, the head guard, Miller, comes in one morning claiming that an executive order has come down through the pipes to transfer anyone with Dragonscale to another prison where they’d be treated to wider spaces, the best available medical treatment, and best of all a return to three square meals a day. More than half of the prisoners end up outing themselves, and Gil himself nearly went and would have it not for The Mazz’s firm grip & subtle head shake. The resulting massacre is heard from outside minutes later. Gil describes hearing nothing but gunshots loud enough to shake the walls for a full half-minute. And these weren’t pistols but fully automatic rapports. When Miller came back, he claimed they’d tried to escape. No one left dared contradict him. Gil explains that his own escape came when he & The Mazz volunteered to clean up the mess. As horrid as it would be, Gil explained, it was worth it to get some fresh air. Outside, another of the guards, Devon, was there with a clipboard keeping track of names. Gil & The Mazz were two of ten men who slowly loaded bodies into a flatbed truck. At first it had been easy, but soon enough the two of them had had to get into the truck itself to rearrange the bodies to make room for more. Gil says he figured there were maybe 40 bodies stacked up when– with no warning and if if they’d both planned it all along– The Mazz grabbed Gil’s arm and pulled the two of them down and under some of the other bodies, which is how they later escaped. Under the dead bodies of their murdered mates. Devon helped, of course. Gil explained that when the job was done and he came onto the truck with his clipboard, he & Gil locked eyes for a few seconds. And whereas The Mazz had earlier saved Gil’s life with a subtle head shake, now it was Devon’s subtle head nod which did the deed. Minutes later, the truck rolled away and Gil and The Mazz were free. Hill’s ‘story’ finished up with a reminder that this is a story-within-a-story. Carol asks how they got from the truck to their camp and Gil explains simply that later that night when the truck was parked they slipped away but got caught between a parking lot and a large pond, which is where ‘the fireman’, whom everyone already knows, found them. But the story has one final nasty little bit to leave with us. Carol thanks Gil for his tale then, almost regretfully, asks Mindy & Bowie to return him to lockup. Gil chuckles, saying he had thought to ask to be transferred out of their makeshift prison and into the general population now that his trust had (hopefully) been established, but admits that it’s obvious that would be the case. Black & White interior image provided by CD. MY REVIEW: This story has it all: Action. Intrigue. Corruption. Kindness. Escape. Distrust. A mysterious, deadly, horrifying virus. And all placed into a backdrop of a formerly civilized society slowly degrading into anarchy. The only thing it seems to be lacking is love. (And for the record, the novel itself has enough of that to keep your romantic heart at bay). But I think the most powerful aspect of “How We Got Out of the Furnace” is how effective it is as an advertisement for the rest of Hill’s novel. The point of publishing it separately is to get you to buy the rest of the story. I’ve done this as an author myself, and Amazon & other publishers do it routinely: ‘Here’s a free sample. Want more? Just click here!’ It’s an effective tool that everybody– readers & writers & publishers alike– are pretty happy to indulge in. But what sets this one apart is that this novel excerpt doesn’t come in the novel’s opening chapter. Yet it stands as a representative for much of what the rest of the novel repeatedly dives into. And the best moment of this ‘short story’ (if you can accurately call it that) comes in Gil’s opening monologue– the one when he explains how the world had gone batty, how even reasonable folks like cops just trying to do their jobs had lost all reason and had instead fallen slowly into an existence of paranoia and fear. Even though I’ve only read about half of it thusfar, it’s a clearly repeated theme of The Fireman. We even see that theme repeated in “HWGOotF” itself… at the end, Carol Storey admits she can’t afford to allow Gil to go around their camp freely. She has to lock him up again. And while her crew aren’t afraid of the Dragonscale spore like the rest of America & the guards at the Brentwood county lockup are, she is afraid of the reputation that comes along with the colored jumpsuits Gil & The Mazz are wearing. The whole story reeked of fear. Fear of what a convicted felon will do if left to his own devices. Fear of getting infected with a deadly disease. Fear of suddenly bursting into flames because you’re one of the infected. And yet it also reeks of hope and kindness as well. Devon is kind and helps the two men escape. The titular character of the novel, the ‘Fireman’ himself, somehow found & helped the two men finish their escape, and even Carol Storey herself– though in this scene is both described as and is showing signs of paranoia– has helped create a sanctuary for those who are infected like herself. Kindness exists. Even in the darkest days. But fear exists, too. In ever more destructive and creative ways. I suppose one of Mr. Hill’s messages to us– seen in both the novel & this excerpt– is that both are parts of what makes us human and will always be here. Josh Malerman author blurb provided by CD. PLOT (with spoilers! ): George is six and easily frightened by his Aunt Muriel’s odd behavior. For several hours each day, she stands a few inches from the wallpaper, contemplating how to walk through it. She always wears one of three dresses when she does this: a red one, a white one, and a cream one. For no reason he could understand, George had always thought she’d be wearing the cream one when she finally did it. Usually she was barefoot, though sometimes she also wore shoes. Sometimes she even wore a hat. George liked the idea of controlling the matter of your own body and even secretly rooted for her, but it still scares him because he also has nightmares where she’d get stuck halfway through the wall or sometimes with just her fingertips embedded and unable to get free. When a teacher convinces George he could accomplish anything he puts his mind to, his inevitable response of ‘Anything? I want to walk through a wall,’ failed to impress the teacher and, later, his parents. His punishment was to spend time in his room thinking about what he’d said, and George did. He even looked up ‘molecules and the spaces between them’ on his computer. He didn’t understand most of what he found, but he did manage to pass his sentence by trying to pass his hand through the top of his desk… which his mother caught him doing, of course. This spurns yet another talk with his parents. This time, however, they openly explain that George’s Aunt Muriel wasn’t well. She had been deeply in love with a man and engaged to be married, but he’d left her a week before the wedding. George learns enough from that talk to keep his encouragement for his Aunt Muriel more quiet in the future. One day not too long after, George invites his friend Delano– who apparently knows all about his Aunt Muriel– to his house. They discover the house is empty, however, and find only Aunt Muriel’s unused, white wedding dress on the floor in the kitchen at the very spot where she usually stands facing the wall. When they turn around, however, there is Aunt Muriel, naked, shaking with energy, and smiling. George goes to her, overjoyed, and hugs her while Delano quietly leaves. “I did it!” she tells him while stroking his head, and George doesn’t mind her nakedness or her fingers scratching through his hair. They were fingers that had walked through a wall and that understood matter and what mattered in life, too. 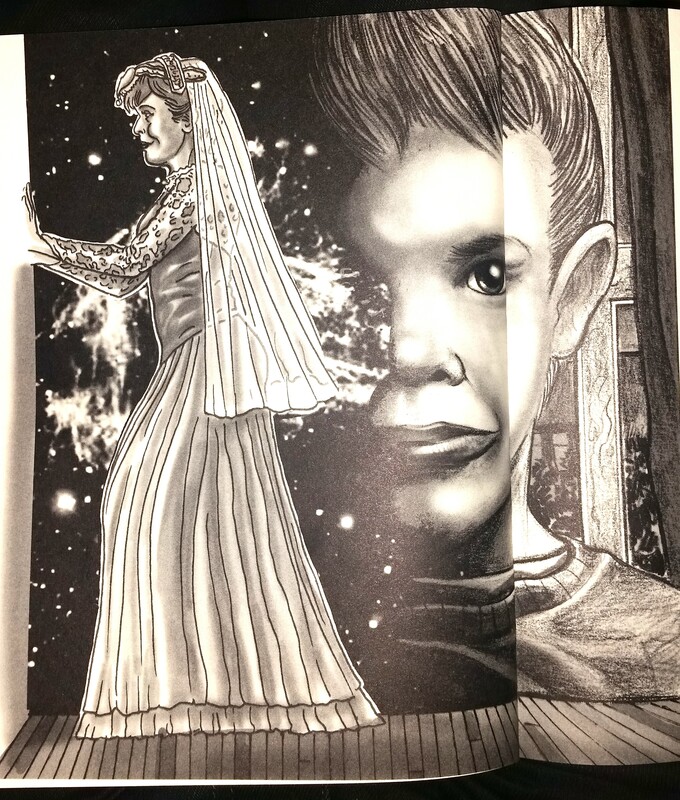 The story ends with George fetching Aunt Muriel’s cream dress to wear, where she stands in the kitchen where he always envisioned her coming through the wall. Then the two of them go outside and she begins telling him about herself when she was young before she learned about the spaces or how a person is made up of pieces, all of which are under control. ‘Matter’. It’s the story’s title. It’s the physical state of things such as a wall or a human body. And it’s an emphasis of the important things in life such as family. ‘Control’. It’s being in control of your life (Muriel has lost it/ George is a child & wonders what it’s like/ George’s parents just want more normalcy). It’s also being in control of your body, as far down as the molecular level. It’s also Aunt Muriel’s inability to control her fiance’s actions. I like that kind of stuff. I’ve done it myself, with both of those words, actually. I also like that the real meaning of the story isn’t whether or not Aunt Muriel actually walked through the wall, but that she finally found a way ‘through the spaces’ of her muddled life and to rejoin society. This story didn’t impress me the way that an A-level story would. And to be quite blunt, I wasn’t left thinking or wondering if Aunt Muriel really walked through that wall or not. Perhaps a lot of my disappointment is because whether or not she pulled off the impossible turns out to be irrelevant in this story. That’s kind of disappointing, both to my reader’s sense of wonder and also to my likeness to the 6-year-old protagonist who should have been obsessed with his Aunt’s crazy idea. And I think that’s the greatest heartbreak of all here. George is six. His crazy aunt thinks she can walk through walls. His parents are worried about it. He dreams about it. He gets in trouble because of it. That’s all pretty cool stuff and right in the wheelhouse for any 6-year-old behavior. So why is it that when the big moment happens I get the feeling George is acting more like his father than a little kid? He’s ‘overjoyed’ that she “finally did it,” sure, but he didn’t see it happen, and immediately he’s involved in yet another heart-to-heart talk like grownups do so often. Don’t you think a little kid who was secretly obsessed with such a thing would demand his aunt do it again just so he could watch? Don’t you think he’d want to know HOW she did it so he can try himself? George does none of these things but is instnatly transformed into a young adult. Sure, moving on/ growing up is clearly a theme in the story, but the joy & sense of wonder of childhood was right there for the picking, and it was never picked up. There’s one other thing, too. The character of Delano serves no real purpose other than a slight change of pace. He doesn’t add to the protagonist’s difficulties or abilities to overcome anything. He appears late in the story but has all the knowledge we do about Aunt Muriel which feels a little anticlimactic since it’s apparently no big deal. Worst of all, he literally sneaks out just when the denumont comes. Yes, it was creepy awkward being there with your friend’s naked aunt in the kitchen, so I get that he’d sneak out. But the point here is that while his actions are perfectly natural (and I include the earlier dialogue & descriptions leading up to this scene), there’s no real reason for him to be there in the first place. Question: How would the story be different if George came home alone that last day rather than with Delano? Answer: It wouldn’t be different at all… other than the reading audience wouldn’t be distracted for a few moments first. For Delano to have mattered, he would have needed to be introduced earlier in the story and have had SOME kind of critical role in George’s appreciation/ connection with his Aunt. Maybe Malerman couldn’t figure out that role, and that’s fine. But this only begs the repeated point: Why bother having him in the story at all? All of this feels like a long poo-poo on a story that I must have hated a whole lot. Sorry about that. I didn’t hate it at all. I was entertained, and as I started out, I also enjoyed the use of words with multiple meanings. It’s a fun idea, and the opening line was a shocker & definitely caught my attention. If I really didn’t like this one, I’d give it far less than a B rating. But overall it comes out as a simple story that stands like a weakly- acted one-act play, something to enjoy for the moment and then forget. Have a Cemetery Dance story you’d like me to review? Have any questions or comments about CD in general? https://i1.wp.com/www.fictionvortex.com/wp-content/uploads/2016/09/Bone-Pile-FV-Featured-Image-11-1.jpg?fit=1024%2C512 512 1024 K Edwin Fritz http://www.fictionvortex.com/wp-content/uploads/2017/10/grey-fv-banner-01-300x138.png K Edwin Fritz2017-01-01 09:03:072018-06-04 10:32:14014) CD Review #5: "How We Got Out of the Furnace" & "Matter"